A simple clock app that represents the time of day as a string of Dominoes. This elegant time keeper was inspired by the classic Game of Dominoes. 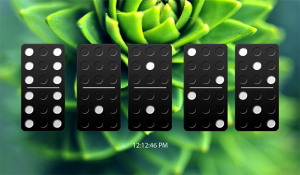 The Domino Clock for BlackBerry PlayBook is function following form for a change. Utilitarian yes. But perhaps a piece of art as well? The Yahoo! Finance App for BlackBerry brings you total coverage from your favorite financial source.